The bedroom is the most popular room of a home where you spend most of your time in. For many it is the most favourite room in the house and therefore it need to be as comfortable and inviting as it can possibly be. No matter how small or big the room, storage is always never enough. When completely avoided the room will appear to be cluttered and in a mess, too many storage units and you have the room caving-in. Before you address your storage concerns, for a tiny bedroom space first ensure that the design fundamentals are in place. Pastel wall colors, bigger windows, ensure that the window covering do not cut out the light when open, mirrors to bounce light around and the flooring to be again of a pastel shade. For the wall colors ensure that the color palette is of a single tone and there is ample amount natural light access to the room. The furniture in the room should be made to measure for optimum space utilisation. The underneath of the bed is very often an ignored space for creating a storage unit. Generally a king sized bed is 42 square feet of space which means there is ample amount of space you use to store seasonal clothing or linen which isn’t used frequently. Under-bed containers are units you can use to nicely tuck away clothing you wont be using for the next change in seasonal weather. Purchase storage bins that can roll in and out for easy access. Before you go out and make a purchase for armoire or a dresser consider reworking your existing closet space. Hanging space can be better utilized to make way for additional storage space. This would mean going vertical with the use of mechanized rods. Take up the entire wall horizontal wall space and utilize corners in the closet. 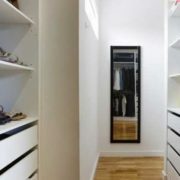 Storage space can be created behind the recess of the mirror in the closet which can be used for everyday accessories and makeup. For your dresser use divider for drawers to free up space. The idea is to utilize existing storage space that you have earlier overlooked or underutilized. Going vertical on wall of the room with not only storage units but also decorative pieces is nice touch to add to the room. Showcase your hobbies or add picture frames to create open areas. If you like books, add it to the mix too. This would work as a shallow wardrobe wall which will double up storage. When maintaining an office at home it is advisable to use every inch of space to maximum advantage. Floor to ceiling cupboards can be installed where everything can be methodically arranged making use of the maximum available space around. Consider open shelves on the walls for easy access to small items. Fancy pull out baskets or shelves with neat labels can be used for filing instead of the traditional old filing cabinets which look just ugly and outdated. This makes it easy to sort papers/files whenever needed. Allocating dedicated drawers for bills and bank statements makes it easy to access, reducing clutter in the process as well. Mail which arrives can be easily sorted and put in the respective baskets and the place cleared up. Keep in mind more the clutter the more congested the small will appear. Offices can be set up in the living room since this area of the house is a little spacious. If you have to choose a spot for your desk it should be near a window for the benefits of natural light instead of a dark corner. Check the space for plug points, besides the natural lighting, additional lighting would be needed for the darker hours of the day. Before you place the desk, ensure that there are no reflections or glares on your line of sight or on your electronics. For a work table, choose once that has a large surface area and sturdy. Partitioning the area from the living or dining room should be ideally done with shelves or cabinets which helps in setting the space apart from the other elements the room. Pick a spot that does not cause any hindrance to the functioning of the everyday kitchens tasks. An empty wall would be an ideal spot or if you have table-space in the area would work as well. Make the most of the wall areas by either adding storage space or even a backsplash for notes, memos or calendars. Repurpose a few kitchen drawers or cabinets to create storage space for paperwork and books. For additional space, pullout shelves can be installed on the desk or even on drawers. Look for open wall space that you can use as a cabinet for storage. Beside cabinets, open shelves placed with boxes or magazine racks can be added. The space has to also be equipped with power points for all your electronic equipments, power strips can be added if required. To save space on your desk, mount your computer monitor to the wall and have the keyboard on the pull out shelf. With the right creativity a garage space can transform into the perfect workspace from home. If you are looking for a 360-degree turnaround, replace the concrete flooring with hardwood floors. Wall paints if need to be changed consider pastels to give the room a professional look. Generally garages do not have windows built in allowing very little natural light inside the area. For better natural lighting place a large sized mirror across the entrance to allow light to bounce of it. Garages also have very limited wiring coming towards it that is needed to power electronics or equipment, ensure you check for plug points, internet coverage before you bring in your equipment. Is your kitchen triangle making you run about to every corner when you cook a meal? If you feel the need to rearrange things around to get the best of your space, this is the guide for you. The kitchen triangle can get a bit complicated in a modern layout setting. At the same time, appliances can easily be the most expensive part of the kitchen remodel thus, it is vital to make the most optimal use of these appliances. They need to fit in the right space and you would have to decide where it will go. Being modular kitchen dealers in Goa for over a decade here are some of our key pointers to get you going with it. Although the work triangle is widely spoken about, keep in mind that it is not the only solution. Kitchen triangles are a concept where the refrigerator, sink, and stove are within 9 feet of reach. Although ideal, it can more than often complicate the kitchen’s design if you are too strict on having it in the layout. For most homeowners it is a workflow in the cookery that is most essential and this revolves more on personal choices of individuals more than anything. Many prefer an even space distribution between the prep, cooking and clean-up counters. In some cases layouts can easily accommodate two work triangles performing two different functions, with a refrigerator near the prep sink and the microwave and clean-up zone arranged near the primary sink. Appliances which are not used everyday can be placed further away from the main cooking zones to help the kitchen function efficiently. The sizes of appliances can make or break your kitchen space. When larger sized appliance are placed in the kitchen it may compromise storage or take up counterspace. Yes, the appliance you looking to buy maybe absolutely needed for the space, but you may have to consider whether the largest sizes is what works in the space. Microwaves, ovens and fridges are some of the most common appliances which can be scaled depending on what the sizes of your space are. Avoid placing these appliances on the countertops to reduce clutter and free-up open spaces. The color and the styles of appliances also needs to blend with the style of the kitchen. Often neutral shades are most recommended as these shades balance with most kitchen styles. Upgrading a rented apartment’s kitchen may sometime not be viable or may need to be permanent which many apartment renters may not opt for. If you one of those renters that are looking to uplift the look of your kitchen without tearing everything apart or don’t want to spent too much on it and still make impactful changes and additions to make the space look better here is how you can go about it. Adding mirrors is a great way to achieve the right balance of visual positivity in the kitchen. Although not used often in this space, the mirror can instantly help make a statement. If your kitchen lacks the natural lighting, place the mirror on the wall exactly opposite to the window that is allowing the light flow in. This would help in amplifying the light entering the room. 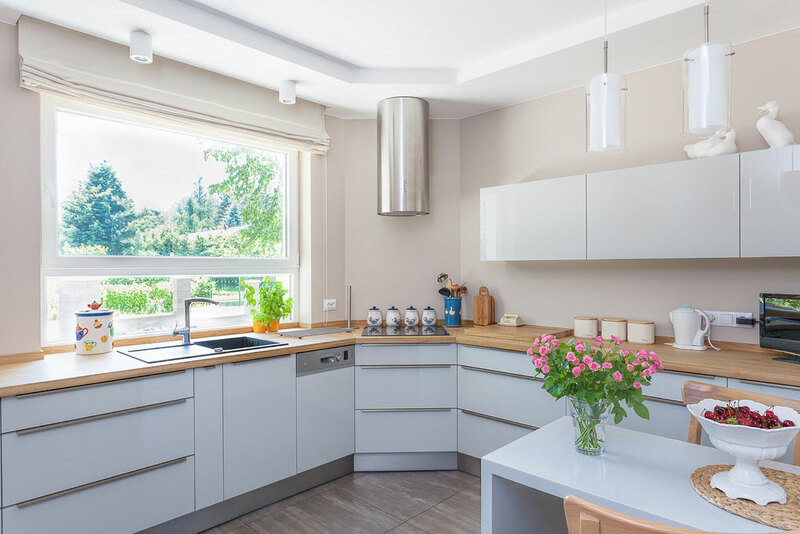 If your existing backsplashes in your kitchen are dull and boring, consider a color that is bright and vibrant and place a temporary backsplashes over the existing one. There are readily available as glue over tiles at most home decor outlets. If the flooring needs to be improved, consider adding vinyl flooring to improve the look of the space. Vinyl flooring is available in different thickness and can be self-installed if you have squared or rectangle kitchen area. Create a new area to sit and relax in an open space that was unused previously in the kitchen. All that is required is a couple of small chairs and a table to sit and have quick sip of coffee or write your grocery lists. If the space permits add a ceiling hanging lamp focused on the table. A small nook is a refreshing new space that has multiple functions which you can used to brighten up the space. Keep a mind the appropriate layout for all the appliances in the area to reduce clutter. Old hardware in the kitchen can be easily replaced by yourself to better the appearance of the kitchen cabinets. Kitchen hardware is available any at most hardware dealers and is in a large variety of price points and styles. If the budget permits get an estimate from a modular kitchen dealer for additional upgrades such as new cabinets or countertops. Adding of storage to the existing layout will help in keeping the kitchen organized and free of clutter. For storage options consider storage cabinets on wheels that can placed aside and used whenever needed. Additionally these can be carried when it is time to move out.